“The North Pole” tackles gentrification and climate change—and still makes you laugh. What do melting ice caps and North Oakland have in common? Extinction. That’s according to The North Pole, an ambitious new web comedy series about Bay Area gentrification that hits YouTube on September 12. Set in Oakland, the show, which takes its title from a nickname locals have given to one rapidly changing part of the city, takes a unique approach to this well-trod topic by pairing it with a broader discussion about the threat to so-called native species—people of color. On its face, this is an odd pairing of topics, but it makes sense given the show’s origins. The series was produced by Movement Generation, an Oakland-based ecological justice organization. It was bankrolled in part by $25,000 in donations from a campaign that co-creator Josh Healey started on Kickstarter. “This is a movement, not just a series,” says lead actress Reyna Amaya. Healey, who has called Oakland home for a decade, and his fellow co-creators Darren Colston and director Yvan Iturriaga, had grown tired of hearing white people talk up environmental justice while ignoring the concerns of communities of color. The North Pole is their effort to bring those two conversations together. “I think the most effective form of communication is through stories where people can come up with their own meaning,” he told me over coffee one recent morning at Cafe Dejana, an Eritrean breakfast spot in North Oakland. The creators’ ambitions are lofty and, for the most part, achieved. In seven episodes, each clocking in at just under 10 minutes, they manage to develop complex characters (roommates Nina, Marcus, Benny, and Fin), have fun with an assortment of Oaklandish lingo—”yaddadamean”—and follow through on an emotional storyline that doesn’t always go where you might expect. It’s also pretty damn funny. The series falls short when it tries too hard to get its social message across: A polar bear (who hates skim milk) shows up periodically to symbolize the extinction of another native species, and the random cameos prove more distracting than enlightening. But the show earns back some street cred with appearances by an impressive list of East Bay personalities, including former Black Panther leader Ericka Huggins, Boots Riley (of the Coup), Mistah F.A.B., and comedian W. Kamau Bell. 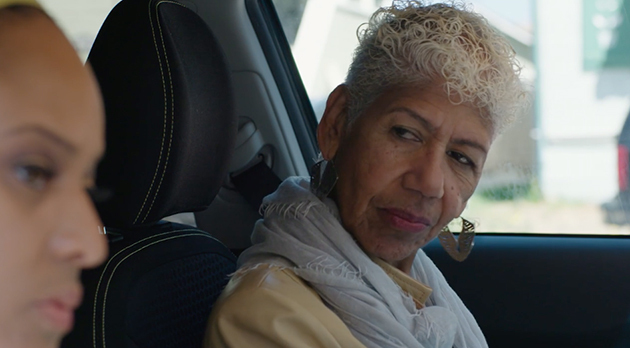 Former Black Panther Ericka Huggins portrays an Uber-driving grandma. It’s the core characters, though, that make The North Pole worth watching. There’s Marcus (Donte Clark), a techie from the ‘hood trying to find his place in the new Oakland landscape; Benny (Santiago Ross), a politicized stoner; and Finn (Eli Marienthal of American Pie 2 fame), the white-boy gentrifier who does his best to become an ally. Nina, played by Oakland-born actress Reyna Amaya, is the witty powerhouse that holds it all together, thanks in part to her ability to draw on her own experience. In one of the more meaningful scenes, Nina argues with her Uber-driving grandma, played by Huggins (the irony of a former Black Panther driving an Uber is hard to miss), about the legacy of 1960s black activism. Here Huggins plays a semblance of her real self, alluding to 5 a.m. wake-up calls during the Panthers’ free breakfast programs. Free tickets for the September 7 series premiere at Oakland’s Grand Lake Theater, featuring a discussion with creators and cast, are available here. Also, a correction: Healey is employed by Movement Generation, not Kickstarter (as an earlier version of this post indicated).